During the previous two modules, your child learned about the parts of the brain and what each does, as well as about neurotransmission. 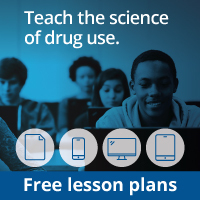 In the next two modules, he or she will learn about drugs—some legal with beneficial attributes and negative consequences, some legal with negative consequences, and some illegal. The group of drugs covered in module 4 is called stimulants. There are many different kinds of stimulants. The ones focused on in this program are nicotine, caffeine, cocaine and amphetamine, and Ritalin (the prescription drug used legally to treat ADHD). Stimulants cause accelerated heart rate, increased blood pressure, and an increase in the rate of the body’s metabolism. Nicotine Tobacco; found in cigarettes, cigars, and smokeless tobacco Smoked, chewed, or inhaled Can cause nausea and vomiting is. Nicotine is addicting and use results in the harmful effects of tobacco use such as lung cancer, emphysema and bronchial disorders. Prenatal exposure to tobacco use can impact the developing baby. A mild stimulant, nicotine reaches the brain just 8 seconds after being inhaled. It activates areas in the brain that experience pleasure and reward by increasing the release of the neurotransmitter, dopamine. Causes increased heart rate and blood pressure by acting on the same receptor as the neurotransmitter, acetylcholine. Caffeine Found in coffee, tea, cocoa, soft drinks, and some medications Taken orally in pill form or consumed in food and drinks Reduces fine motor coordination, alters sleep patterns, and can cause headaches, nervousness, and dizziness. Stimulates the central nervous system by increasing the metabolism inside neurons. Increases wakefulness by blocking the neurotransmitter, adenosine. amine Cocaine is also called crack; amphetamine is known as speed, uppers, meth, copilots, and crank Snorted, smoked, or injected Cocaine causes dizziness, headaches, anxiety, insomnia, and depression upon withdrawal in those who use it chronically. Amphetamine can cause increased heart rate, reduced appetite, and insomnia. These drugs also can make people feel anxious, raise blood pressure, cause dangerous and irregular heartbeats, chest pain, shortness of breath, nausea, vomiting, and diarrhea. Alters the actions of the brain’s neurotransmitters—mostly dopamine. Over time, these drugs change how the dopamine neurons work. This, in part, is why users become addicted to the drugs. The user needs them to keep from feeling bad. Methyl-phenidate* Ritalin Taken orally in pill form, crushed up and snorted, or dissolved with water and injected When taken as prescribed, helps with focus and learning. When abused, causes increased wakefulness and euphoria. Prescribed for attention deficit hyperactivity disorder (ADHD). When taken in doses other than those prescribed. Ritalin can rapidly increase brain dopamine and disrupt normal communication between brain cells. This can lead to addiction. *Several studies have shown that children who have ADHD and are treated with methylphenidate are less likely to abuse drugs and alcohol when they are older than those who were not, but more research needs to be done. Methylphenidate taken without a doctor’s prescription can cause addiction and sometimes death. This activity aligns with the following standard identified in the National Science Education Standards: science in personal and social perspectives. The students observe the effects that three drugs have on the brain and the nervous system. They discuss the impact this information has on their lives and how they can use it to make wise decisions about their own health. Talk to your child about the different types of drugs and how they affect the brain and body. Have your child begin to think about the reasons people would abuse drugs when they know how harmful they can be. It is very important to discuss with your child the differences between taking Ritalin for ADHD in the dose and method prescribed by a doctor and abusing Ritalin. Inform your child that Ritalin will increase the attention and focus in people with ADHD, while it can cause serious side effects and addiction in those who inappropriately use it. Research has shown that people with ADHD do not develop addiction to Ritalin when used in the form and amount prescribed.